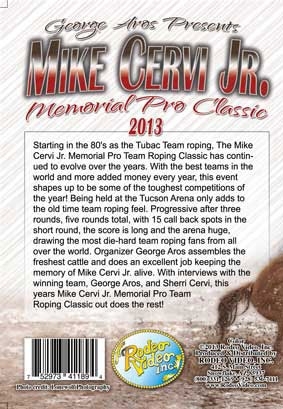 Starting in the 80's as the Tubac Team Roping, the Mike Cervi Jr. Memorial Pro Team Roping Classic has continued to evolve over the years. With the best teams in the world and more added money every year, this event shapes up to be some of the toughest competitions of the year! Being held at the Tucson Arena only adds to the old time rope feel. progressive after three rounds, five rounds total, with 15 call back spots in the short round, the score is long and the arena huge, drawing the most die-hard team roping fans from all over the world. Organizer George Aros assembles the freshest cattle and does an excellent job keeping the memory of Mike Cervi Jr. alive. 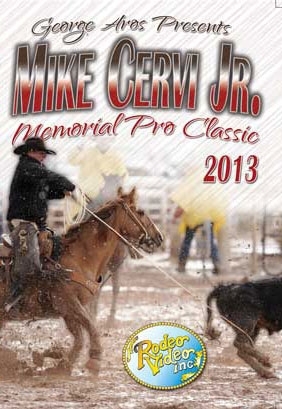 With interviews with the winning team, George Aros, and Sherry Cervi, this years Mike Cervi Jr. Memorial Pro Team Roping Classic out does the rest!